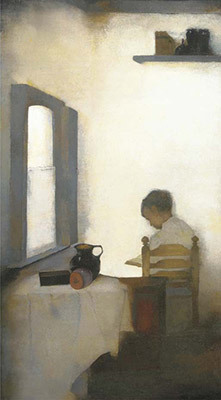 I discovered Jan Mankes accidentally and only very recently. He was a dutch painter who sadly died in 1920 of tuberculosis. He was just 30. I can’t remember which of his paintings caught my attention first, but I’m sure I was immediately intrigued by the mood permeating it. They all have a fairy tale quality even when representing the most mundane of objects. Sometimes while sketching ideas for new paintings I struggle to get to the vision. I might insist too much on one aspect forgetting the rest, requiring me to start again to find the exact image. It’s part of the process and sometimes it’s smooth, other times it requires a longer warm up and trial. That’s when looking at Mankes’ work became an instant way of tuning into a particular vibe I was looking for. 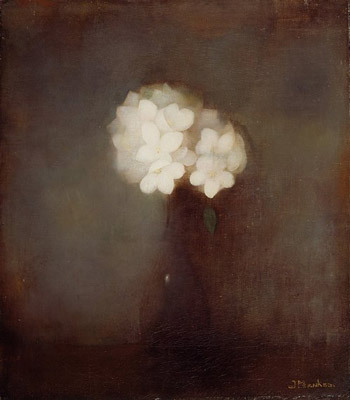 At times it was a color tone, often the way he lights the scene from behind, but generally it was the mystical aura he put into everything, even an ordinary vase of flowers. He was one of those artists who could paint silence, the moments of solitude when life seems to vibrate out of the stillness. There is such an experience. To some it’s frightening, to others it’s magical. For this reason he can easily be listed among the symbolists, even though labels don’t matter much. They are just a way to help us identify certain features we might not easily to put into words. In simple terms: while a realist would paint a vase as it appears to the eye, in its most objective and empirically quantifiable features, the symbolist paints the vase as it appears to the mind, as a bridge into something else. The vase is not a vase. Mankes achieved it by color tone, lighting choices, hazing the edges of all forms and reducing composition to the minimum, but mostly by being one with the entirety of his own perception. What is not there becomes as evident as what is. Hence the sensation of silence. He particularly liked to cast a very intense pale yellow light on the background, turning foreground figures almost into silhouettes. Another dream-like quality of his paintings. 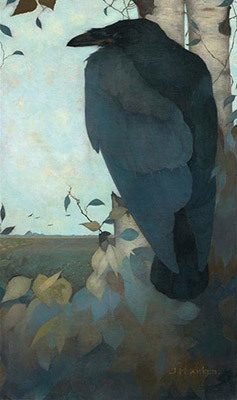 Lastly, if there’s a more identifiable symbolist touch it’s perhaps this one: birds. He painted crows, owls, roosters and even eggs more than once. There’s something about these creatures that always catches the attention of the mythologically inclined. 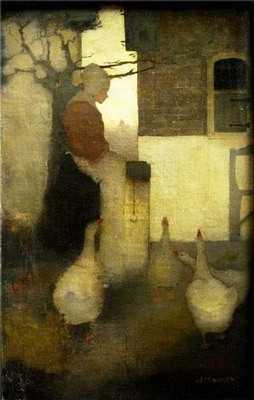 I can’t imagine what would Mankes have painted had he lived much longer. It’s one of the tragic losses in art, together with other great artists I want to at least mention: the German expressionists Franz Marc and August Macke, who died in the first world war on the field. August Macke was especially talented and he was only 27. I’m glad that, despite their short lives, the great work of artists like these can still be appreciated and be part of the legacy. These are names we should speak of more often.